The Philips OnSite/HS1 is designed for the ordinary person in the extraordinary moment. Philips HeartStart OnSite defibrillator acts as your personal coach to guide you through the process of treating a victim of suspected sudden cardiac arrest. The OnSite AED provides real-time guidance through simple, step-by-step voice commands and CPR coaching. Life Guidance features provide step-by-step voice instructions, including CPR coaching, to help give you the confidence that’s needed when treating a cardiac arrest. 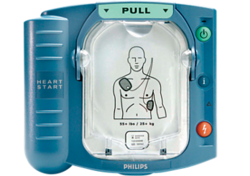 Just pull the green handle to activate the defibrillator and its voice instructions are paced to your actions to help guide you through the entire process – from placing each pad on the patient to delivering a defibrillation shock and performing CPR. HeartStart OnSite/HS1 is virtually ready to rescue out of the box so you can enjoy peace of mind knowing that it is deployed corrrectly and ready when needed. Integrated SMART pads placed on the victim’s bare skin sense and adapt the defibrillator’s instructions to your actions every step of the way. SMART pads II guide the AED to adapt instructions to the pace of the responder so as not to overwhelm, run ahead or slow them down. In addition to being repeated, prompts are rephrased and include additional instruction to help understanding. Unique in its design, the HeartStart Trainer has been developed to train individuals on how to use the HeartStart Onsite and HeartStart Home Defibrillators. Ready to act, ready to go. Life Guidance features provide intuitive step-by-step voice instructions, including CPR coaching, to help give responders the confidence that’s needed when treating a cardiac arrest. Designed to be rugged and reliable, and one of the most comprehensive self-testing AEDs on the market, making it virtually maintenance-free. The Ready Pack configuration arrives to you complete and virtually ready to rescue. Integrated SMART Pads placed on the victim’s bare skin sense and adapt the defibrillator’s instructions to your actions every step of the way. Insert the Infant/Child Key and HeartStart FRx adjusts it’s Life Guidance to provide special pad placement and CPR instructions designed to treat infants and children. Defibrillation therapy automatically reduces to levels suitable for an infant or child. SMART Analysis automatically assesses the victim’s heart rhythm and is designed to only deliver therapy if the rhythm is determined to be shockable – even if the Shock button is pressed. Operating: meets MILSTD 810F Fig.514.5C-17, random Standby: meets MILSTD 810F Fig.514.5C-18,swept sine. Truncated Exponential Biphasic. Waveform parameters adjusted as a function of each patient’s impedance. Adult defibrillation peak current: 32A (150J nominal) into a 50 ohm load. Pediatric defibrillation (with optional Infant/Child Key installed): 19A (50J nominal) into a 50 ohm load. Protocol Device follows preconfigured settings. 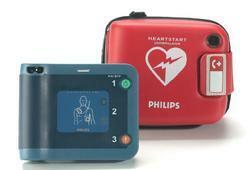 Defibrillation and CPR protocol can be customized using HeartStart Event Review or HeartStart Configure software. Able to deliver a shock after the end of a CPR interval, typically in eight seconds. The Lifeline AUTO AED is a fully automatic defibrillator designed to analyze heart rhythms and automatically deliver a shock—without intervention—if needed. 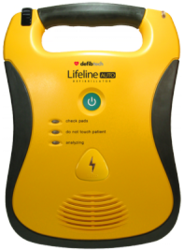 The Lifeline AUTO AED includes all mission critical features necessary to provide the most advanced treatment for Sudden Cardiac Arrest. The Lifeline AUTO AED has a simple one button user interface, clear, calm voice prompts, brightly lit progress lights and actively illuminated status indicator. 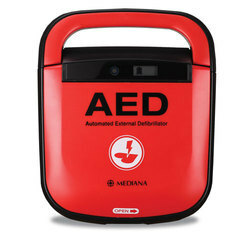 The Lifeline AUTO AED has a roomy handle and rubberized surfaces. 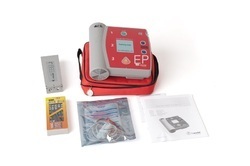 The Lifeline AUTO AED is compatible with both AHA 2010 and ERC 2010. 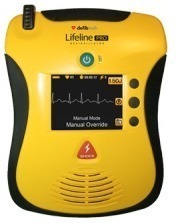 The Lifeline AUTO AED is cleared by the FDA and carries the CE Mark. 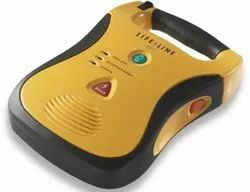 The Lifeline PRO AED offers professional responders a fully manual mode that displays the ECG and allows total control of shock energy and delivery. The Lifeline PRO AED can also function in AED mode that gives step-by-step instructions for performing CPR, rescue breathing and external defibrillation. The Lifeline PRO has Real Time Protocol Selection which enables the user to switch rescue protocols from CPR with breathing to CPR without breathing and back again. Additionally, the Lifeline PRO AED provides a non-diagnostic ECG monitoring mode to allow for heart rhythm and heart rate monitoring using standard ECG electrodes. The Lifeline PRO AED has clear, calm voice prompts as well as on-screen text prompts. The AED Status Screen displays essential information, such as battery life and pad expiration dates. The Maintenance Mode permits the user to perform maintenance related actions as well as change unit parameters. The Lifeline PRO has a brightly lit status indicator and rubberized surfaces. 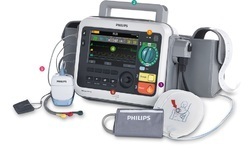 The Lifeline PRO AED supports current AHA and ERC Resuscitation Guidelines. The Lifeline PRO is certified for export from the USA and carries the CE Marking. The Lifeline AED is a semi-automatic defibrillator that is technologically advanced enough to include all mission critical features necessary to provide the most advanced treatment for Sudden Cardiac Arrest. Yet is so simple and unintimidating to use that even non-medical personnel can effectively save lives. The Lifeline AED has a simple two button user interface, clear, calm voice prompts, brightly lit progress lights and actively illuminated status indicator. The Lifeline AED has a roomy handle and rubberized surfaces. The Lifeline AED supports current AHA and ERC Resuscitation Guidelines. 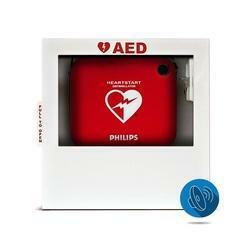 The Lifeline AED is authorized for marketing in the USA and carries the CE Marking. CPR, while an integral and crucial component of the resuscitation process, often isn't enough to convert your patient's heartbeat to an effective rhythm. Dramatically increase survivability rates of your patient during a cardiac emergency by performing CPR in conjunction with the use of an AED. Early defibrillation is a critical component to master in the cardiac chain of survival. An introduction, even a brief one, coupled with training increases bystander confidence and improves performance in AED usage. Equip yourself and your staff to increase survivability rates for persons in sudden cardiac arrest knowing that no device other than a defibrillator has consistently improved long-term survival from out-of-hospital cardiac arrest. WNL's Universal AED Practi-TRAINER has been completely updated and features many functional improvements from their last version. They gathered feedback from customers, worked with both a designer and a manufacturer to produce an incredible product. Fully compliant with the new 2015 ECC CPR guidelines, this AED training unit includes a replaceable scenario/language module - making it the most unique and cost effective unit on the market today. As an instructor, a few of the features I love include the built-in metronome with audible tones and a flashing light to help students time their compressions to 100 per minute. The clear voice prompts, even when the unit is at low volume, guide students through each step in the defibrillation process. With training comes confidence. Participants will actively embrace both their and the AED's role in the cardiac chain of survival. And that confidence is what saves lives. Are you worried that when ECC guidelines are updated, you'll need to buy an entirely new unit or send it out for costly re-programming? Not with this model – to upgrade to the newest guidelines all you have to do is replace the inexpensive plug-in firmware module! DescriptionThe unit is supplied with a protective outer cover, which when opened by the easy sliding switch, automatically turns on. The defibrillator pads are already connected and ready to use. LED indicator lights flash with the corresponding voice prompts. Visual icons clarify the necessary actions. The adult/paediatric mode switch allows the correct setting without changing the pads. The battery is disposable, LiMnO2 Non-rechargeable, with 2 years shelf life, and 5 years standby life. Save valuable time in an emergency with pads that can be used on adults, children and infants. Philips SMART Pads II for the FRX AED eliminate the expense of having to purchase different pads sets for different patient types. 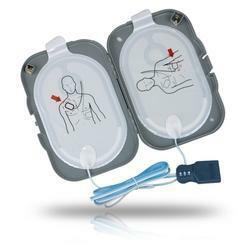 These pre-connected pads are packaged in a semi-rigid pads case for added protection, and are equipped with a HeartStart-compatible plug for easy hand-off to Philips ALS defibrillators and to competitive defibrillators with adapters.